Georgie! 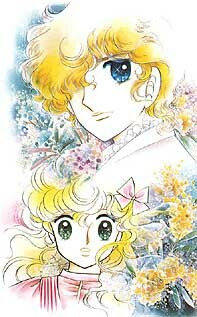 anime and manga series by Izawa Man and Igarashi Yumiko (creator of Candy Candy) images and info. Part of a diverse shoujo anime, manga, video gaming, and live-action Japanese drama website. "Georgie!" 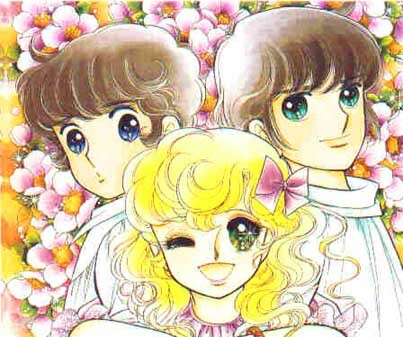 is a series by Izawa Man and Igarashi Yumiko (Candy Candy, Meimy Angel, Ma Mi Mu Me Mitairou), following the life of Georgie and her brothers. The story takes place in Australia and England. 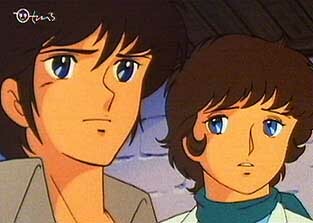 Almost half of the anime portrays their childhood, while the manga starts when Georgie is in her teen years. Georgie is a cheerful and carefree girl who loves her two older brothers very much. Having grown up with Abel and Arthur, the three are very close, and do everything together. What Georgie doesn't know is that as a baby she was found with her dying mother, and was taken in by this family. Her mother left her a special golden bracelet which she wears constantly, but Georgie has no idea of her true past. Abel and Arthur have always treated her as their younger sister, and their father thought of Georgie as his own as well. Sadly, he passed away after saving Georgie during a storm when she was young, and her mother has resented the girl for his death. Her adoptive mother does not like Georgie as much as her own sons, and dislikes the fact that they both adore her so much. Georgie cannot understand why her mother treats her unkindly, but still she cares for her. She wants her mother's approval and love very badly. Georgie is a very innocent girl, who, when doing laundry, will strip the clothes right off of her brothers, despite their protests. One day when out riding her horse across the fields of Australia (and enjoying some delicious food Arthur prepared for her), she leaps over a young man, sending him tumbling out of the way straight into a stream. Georgie, so absorbed in her meal, doesn't even notice, but since she drops her lunchbox, she quickly turns back and sees him. Fortunately he was not harmed at all, but his fancy-looking clothes are soaked. Without a second thought Georgie naively pulls the wet garments off of him so they can dry out on the grass. 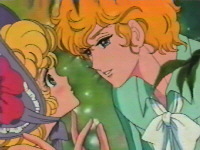 The blonde boy is completely taken aback by this girl, the likes of which he's never met before. Georgie suddenly realizes as she looks at him that she can't treat just any boy like her brothers! Very embarrassed, she hastily throws his sopping pants in his face and runs off! Georgie and Abel see a crowd in town and hear that two famous rich people from England are going on the train, namely Lowell J. Gray, descendant of a navy captain and his fiancee, a princess. Abel hoists Georgie up onto his shoulders so she can see them. Lowell turns around.... and it is none other than the boy she met by the stream that morning! That night Georgie finds herself thinking about Lowell's gentle blue eyes. Later Georgie, very skilled at throwing a boomerang, enters a competition. Only boys are allowed, so she dresses as a boy and ties her flowing blonde hair up under a cap. After she finishes in first place, the reward is announced: a kiss from Elise, a princess of England. Georgie takes off the cap before Elise can kiss her, revealing that she's not really a boy. Lowell is present, and approaches Georgie. He places his hands on her arms and kisses her! Abel, Arthur, and fiancee Elise can only look on in shock. When Lowell pulls away Georgie slides to the ground, dazed. Abel is furious. "You jerk!" he yells, and punches the young man. 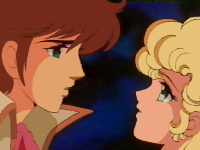 Georgie finds that she is in love with the romantic and kind Lowell. He loves her in return. Before departing for home Lowell promises to return and marry her one day. 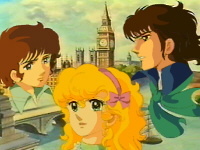 Georgie realizes that she cannot bear to be apart from him, so she arranges to sail to England after him. Unknown to Georgie, Abel has been attracted to her for many years. He had gone to sea in order to not feel the lonely pain of loving her, unable to show it because of their brother-sister relationship. Finally he has returned in time to discover Lowell could take away the girl he loves forever. Abel follows her to England. He won't giver her up without a fight. One of the most interesting aspects of this series is that is it a dramatic love story, but who Georgie will end up with is a mystery until the end. In most stories it is easy to tell from the beginning who the main couple is, but in Georgie! you'll enjoy the suspense of not knowing what will develop in the relationships. What will happen on Georgie's jouney to England? Lowell is not expecting her.... will she find him to be faithful to his promise? What about his fiancee? And what of determined Abel and sweet Arthur?